A neurotoxin, chemical Acryl Amide causing cancer potentially is created when foods rich in carbohydrate are cooked at high temperature, whether fried, baked, roasted. As a general rule, the chemical is formed when food is heated enough to produce a fairly dry & brown-yellow surface. Hence, it can be found in potato chips. Serving size says 10 chips have 145 calories. But who eats only ten chips. So the bottom line is you avoid eating potato chips. Also, avoid tortilla & corn-based chips. These chips can cause all kinds of health problems like clogged arteries, weaker heart & dozens of other health issues. If you stop eating chips you will have a better chance of losing belly fat. Chips are in fact low in Vitamins & Minerals, also low in protein. They tend to displace things in the diet that are full of nutrients. The Sodium content in chips negatively impacts your cardiovascular health. A high intake of Sodium causes an increase in blood pressure that can lead to stroke, Heart failure, Coronary Heart & Kidney Disease. Potato chips generally have between 130-170 mg of Sodium per ounce. One bag of chips certainly contains more than a single ounce, so many of you consume more sodium than you realize while eating chips. You should limit your salt intake to 2,200 mg per day. While people over 50 & anyone with High Blood Pressure, Diabetes & Kidney Disease Should not eat more than 1,400 mg per day. Frequent Consumption of chips can contribute to high cholesterol levels because of the amount & type of fat found in chips. 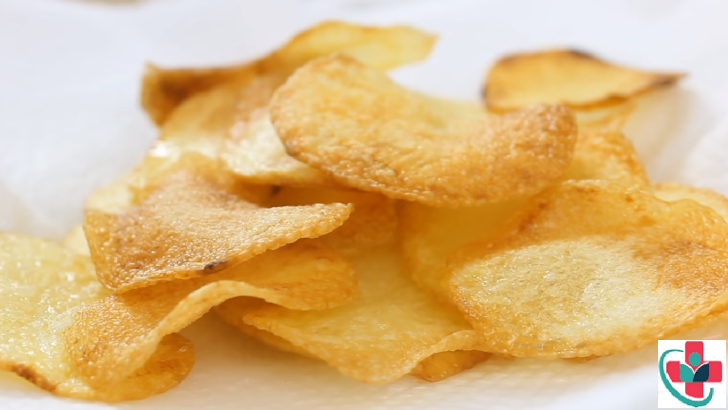 Most chips are fried deeply, a process that creates trans-fat. In addition, the oils used for frying chips are often saturated fats that also contribute to high levels of cholesterol. It is because of high sodium content which eventually leads to water retention, dehydration... kidney diseases.